There are many benefits to membership at the Washington Foreign Law Society, including the opportunity to attend events alongside our distinguished Board of Governors. Over the next few months, WFLS will be interviewing some of our Board Members to showcase the unique and diversified talent behind the Society. Our second featured Board Member is Kip Wainscott, former counsel to the Obama Campaign and current associate at Perkins Coie. How, as a young lawyer, did you come to work as counsel in the Obama campaign? Prior to joining the re-elect, I worked at a law firm alongside President Obama’s 2008 national delegate director, Jeff Berman. In the aftermath of the 2008 election, Jeff led a commission to analyze and improve the Democratic Party’s presidential nomination and delegate selection procedures. Jeff was kind enough to let me staff him through this process, and the party ultimately adopted a number of proposed reforms that I had helped formulate. By the time the reelection effort was gearing up, I was probably one of only a small handful of lawyers in town who had familiarity with the new rules, and Bob Bauer (President Obama’s lawyer, and the campaign’s general counsel) offered me the opportunity to put this niche knowledge to use at campaign headquarters in Chicago. It was a phenomenal experience. What was the legal structure of the campaign? How many lawyers were you working with? There were essentially four buckets of in-house legal work, divided among four lawyers who reported to Bauer and the campaign leadership. In addition to my work (which included mostly ballot access, the nomination and delegate selection process, and miscellaneous litigation issues), there was a designated voter protection counsel, FEC compliance counsel, and corporate counsel, all of whom engaged on a range of interesting work. And, of course, our outside team at Perkins Coie played a major role across all areas. What were some of the issues you worked on? My primary responsibility was to shepherd the ballot access and presidential nomination procedures from start to finish. 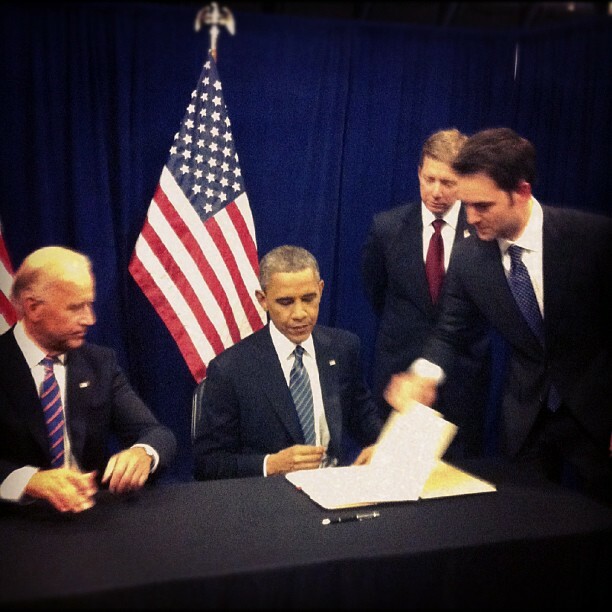 This included qualifying President Obama for each state’s primary contest, electing political delegations to formally support the President’s renomination, and interfacing with the Democratic party on behalf of the campaign regarding any issues that arose under party rules – things like the scheduling of primary elections, and procedures for developing and adopting the party platform. I also worked on certain litigation issues, as well as petition activities in the states. You previously clerked for the Senate Judiciary Committee. Did this spur an interest in international law? Well it really provided a ringside seat to the policy-making process. And from there, it’s easy to see that so many issues confronting policymakers carry global implications. I was clerking with the subcommittee on terrorism, technology, and homeland security, and many of the issues the committee confronted represented challenges that were not necessarily unique to the United States. Understanding the ways in which the international community was responding to these challenges was crucial to informing effective policy solutions here at home. How did you become involved with WFLS? When I was in law school, I represented my school at the Willem Vis international law competition, and one of the judges happened to be Charles Camp, the former WFLS Board President. After the competition, he invited my teammates and me to attend the WFLS Diplomatic Reception, and it was just a great event – interesting people, diverse backgrounds, fun atmosphere. I became involved shortly after I graduated. As a private sector lawyer whose work focuses on elections and campaigns, what is the value of an organization like WFLS? A major component of my practice involves helping clients navigate political and policy-making processes legally and ethically. WFLS is not only a great community for meeting people who are engaging these processes here in the U.S., but it also provides a highly valuable comparative legal forum – which helps me to better place certain aspects of my own practice in context, and exposes me to interesting work that lawyers are pursuing in other fields.